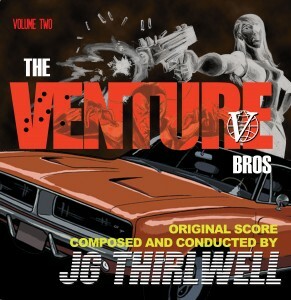 The long-awaited follow up to the highly popular score from the hit Adult Swim cartoon The Venture Bros, composed and performed by JG Thirlwell. The CD version contains 16 tracks, while 13 tracks appear on the vinyl LP version. The vinyl also comes with a download code so the buyer may obtain the full album digitally. The album is available from the Foetus shop online and in retail, distributed by Virtual thru Sony Red, from June 6 2016.